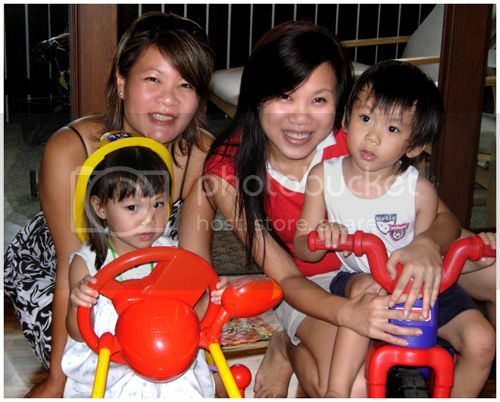 when aidan meets macy =) - A mummy's inane blabberings..
Heh..so cute lah both of them!! Mong meganmacy came visiting with her ahbang, Edward and li' one! She wanted to check out the reno works done by my ID since she's currently looking for someone to do up her new place..
Li' Macy was so adorable with her huge, expressive eyes, rosy cheeks and pony-tails. When she went into Aidan's room, the first thing she did was climb onto his bed. "Aiyoh!" lamented her distressed daddy, ,"Cannot make it that easy lah!!!" The two spent the afternoon playing happily together. They managed to take out all the toys that Nenita had packed nicely and made a huge mess in his bedroom and then moved on to attack the remaining toys at the balcony. After a while, Macy decided to return to the bedroom and jumped onto the bed again..She sat there for a while and called out "Where's Aidan? I want Aidan!". The boy on hearing her, ran in prompto.. Alamak...still so henpecked! Henpecked...haha! Smitten by her beauty lah! OMG! Macy seems to have grown so much since I last saw her!! Mong!! I wanna see Macy!!!! soon, when they are back for good, you can see them often! heh actually, Mong and I were saying that they look a li' like siblings! Haha Macy has that obliging smile in the first picture. it = housewarming? erm, im still not sure leh. wanted to make it next week but kinda rushed..
ya she does. i told her she lost weight but she insist she didn't! yeah i think Aidan really gets along well with other kids.. but he seems to have mostly girl friends? how does he get along with boy friends? what if your 2nd child is a boy, will he be as happy? yeah..most of my close pals have gals. He's fine with boys i guess but it tends to be more parallel play. we went down ode to art today..shortlisted one we liked but hub wanted to look ard more. heh..mong read liao head sure swell. she's been exercising regular..and looking really gd now! wahhhhh! macy very big alr hahaha but still so cute lor. she's still petite but she's lost some weight & grew taller! hiaks..imagine what edward will be like when his two girls grow up and those young guys start knocking on the door!! When she went into Aidan's room, the first thing she did was climb onto his bed. "Aiyoh!" lamented her distressed daddy, ,"Cannot make it that easy lah!!!"